...that I should make a card with My Caroline's favourite set while she's away. I borrowed it back on the 10th of December...I wonder if she's over the withdrawl symptoms yet? Heaven help us if Stampin' UP! ever decides to retire this set...it will NOT be a pretty thing! Anyway, I was cruising SplitCoast Stampers yesterday and decided to try my hand at the Colour Challenge which was to use Barely Banana, Dusty Durango and Basic Grey, as well as our choice of neutral colours (I chose Very Vanilla). 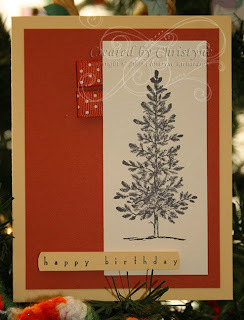 I stamped the tree image in Basic Grey on Very Vanilla (I tried Whisper White, but it looked too stark) and then added it to a larger layer of Dusty Durango before adhering to the Barely Banana card base. I added some ribbon at the top of the tree panel for some added texture and dimension. I stamped the sentiment (from All Holidays) in Basic Grey on Barely Banana. To round the ends, I put the end of the strip into the bottom of a circle punch (hold it upside down) and punched just the end. It's a little off on one side, but the card is for my FIL and since he can't see a thing without his glasses, I think we'll be good - LOL! pretty card, very clean cut. I too love this set, it's great on it's own and also makes good backgrounds to go with other images.